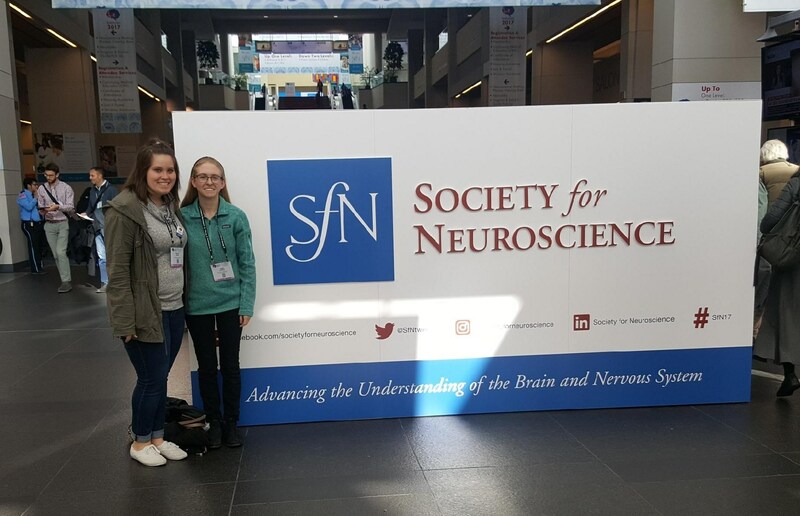 Dr. Lori McGrew, Biology professor in Belmont’s College of Sciences and Mathematics, took her senior research students to Washington, D.C. to attend The Society for Neuroscience (SfN) Conference. SfN’s 47th annual meeting, “Neuroscience 2017,” is the world’s largest neuroscience conference for scientists and physicians devoted to understanding the brain and nervous system. More than 30,000 colleagues from more than 80 countries gathered at the world’s largest marketplace of ideas and tools for global neuroscience. The conference opened Saturday morning with the Neuroscience and Society session. The speaker, Dr. Siddhartha Mukherjee, a physician and researcher, wrote the Pulitzer Prize-winning book The Emperor of All Maladies: A Biography of Cancer, which explores the disease that has plagued humans for thousands of years. His new book, The Gene: An Intimate History, examines the quest to decipher how human heredity combines with life experiences to control our lives. In this lecture, Mukherjee spoke with SfN President Eric Nestler about the excitement and importance of communicating the promise of scientific inquiry to the public. He spoke eloquently about the role of researchers in communicating honestly with the public, the danger of over-promising and the obligation for research to either advance our understanding of the world around us or cure disease. During the afternoon, McGrew presented a poster in the History and Teaching session entitled “Measuring Student Learning Using Closed-Book Timed Exams Versus Open-Book, Take-Home Exams.” Students visited several other posters detailing current research in the field. The group wrapped up day 1 by attending the Presidential Lecture “Insights from Nonhuman Animals into the Neurobiology of Language” by Dr. Jarvis. This lecture presented a modern model of language from molecular, circuit, to behavior levels. Jarvis described key concepts of language, including vocal learning and brain regions that are necessary for vocal language. While most of his work involved songbirds, Jarvis played clips of mouse vocalizations that were modified to be detectable by human ears. These mouse songs were remarkably similar to bird song and are helping researchers to better understand language across species. On Sunday, the groups started the day by attending sessions on brain imaging in Danio rerio, studies of traumatic brain injury and mechanisms of memory. One of the dynamic posters demonstrated a technique for characterizing neural activity in swimming zebrafish by immobilizing their heads in agar gel. That evening, the students presented their research at the Faculty for Undergraduate Neuroscience poster session and social. Students Elizabeth Sparks, Christian Candler, Rebecca Derby and Kara Garrett presented their research findings at the FUN poster session during the Annual Meeting of the Society for Neuroscience. Candler and Sparks presented a poster entitled “Assessment of Memory in Danio rerio following treatment with Natural Sugars, Artificial Sweeteners and Tomoxetine Hydrochloride.” Garrett and Derby presented a poster entitled “The effects of hormones and pathogens on cortisol levels in Danio rerio.” On Monday morning, McGrew attended a workshop focused on evidence-based methods in teaching neuroscience while the students visited some posters describing gender bias in research animals and the role of hormones in memory before returning to Nashville.